For scenes like sunrises, it can be tricky to capture the full tonal range from the deepest shadows to the brightest highlights within one shot. That’s why many photographers take a series of bracketed shots to capture the full tonal range. Bracketed shots are essentially taking a normal exposed, an underexposed and an overexposed shot of the same scene and composition. Later in post-production, you can combine these bracketed photos into a single photo with a high-dynamic-range (HDR). There’s a bracket function on most modern DSLR cameras that automates capturing 3, 5 or more bracketed shots with different exposure settings. 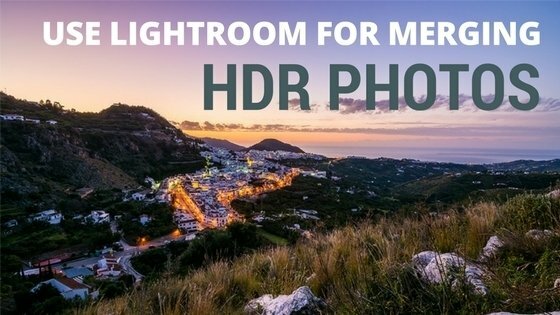 Use External Plugins or Lightroom HDR merge? There are different ways you can process the bracketed shots in post-processing. You can use external plugins from Lightroom that will combine the shots into an HDR file, like Nik HDR Efex Pro 2, or you can buy a standalone program like Photomatix. However, these external plugins and programs come with a bunch of sliders and settings you can tweak to get the HDR look that you want. Options are great, but you need to put effort into getting the feel of how they work. The number one thing, in my opinion, to look out for when working with HDR photos is avoiding an oversaturated and artificial look. An overcooked look is often a result playing too much with sliders we are unfamiliar with, and moving sliders that are not necessary to mess with. Lightroom’s HDR merge feature, in general, takes a more natural look approach to processing HDR photos. You can use the Lightroom HDR merge feature to combine the bracketed shots and use the same sliders from the develop module that you already know for modifying the exposure, contrast, and colors. This gives you a much flatter learning curve if you are already familiar with Lightroom. And your HDR workflow will become incredibly easy. 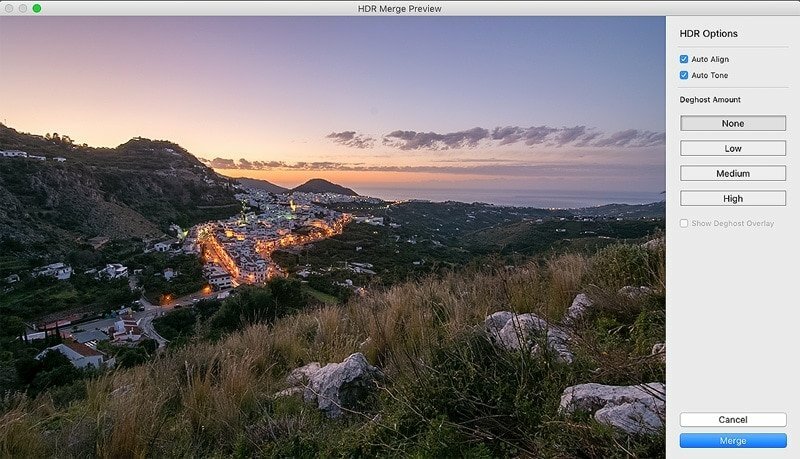 Another benefit of using Lightroom’s HDR merge is that the output file is saved as a DNG file. Most external HDR plugins will save in TIFF format, where the file size is much larger. In Lightroom, you should first of all, find a set of bracketed photos that you want to process to an HDR photo. You can do this in the Library module’s Grid mode (press G). Select the series of bracketed shots that you want to use a source for the HDR photo. Next, right-click on one of the selected shots and choose Photo Merge -> HDR. This will open up the HDR Merge Preview window. This will open up the HDR Merge Preview window. Make sure that the Auto Align and Auto Tone boxes are ticked. If your camera moved slightly between the bracketed exposures, the Auto Align function will attempt to align the exposures before merging them. The Auto Tone function analyzes the merged photo and tries to adjust the sliders available in the Develop module (like exposure, contrast and so on), to get a well-exposed photo. The Auto Tone does a pretty good job. However, all photos are different, so if you don’t like what it is doing, just untick the box and continue. Unticking the Auto Tone check box will, of course, give you a flatter looking starting point for your HDR, where you set all the sliders from scratch yourself. To the left, you can see the result of an HDR-merge with Auto Tone enabled. To the right, Auto-tone was disabled. 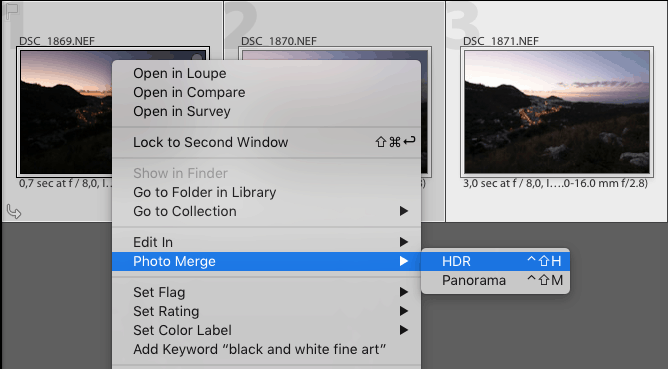 In the HDR Merge Preview window, you can set a Deghost Amount to either None, Low, Medium or High. If you have subject movement in your photo between the exposures like a person moving or trees moving a lot due to wind, you would want to apply some deghosting, to avoid i.e. a person appearing multiple places in the merged HDR photo. You can tick the checkbox “Show Deghost overlay” to see a red mask overlay of which areas Lightroom has selected for deghosting. Back in the develop module, you should check your image zoom at 100% and look out for ghosting artifacts. If you find some, you should try to do the Lightroom HDR Merge again with a higher Deghost amount. When you are sure there are no ghosting artifacts, you can begin to process your image as you normally would process a photo in Lightroom using the sliders you are already familiar with. With HDR photos people often expect that you go a little crazy with the sliders. However, it is easy to push the sliders too far, because your eyes get used to seeing everything as saturated. If you begin with an extreme value, your eyes will have this as a visual anchor point. You can therefore easily end up applying too much saturation or vibrance to your photos. Using external plugins can be useful when you get additional functionality. However, it also complicates the workflow to open up a plugin, tweak sliders that and then return to Lightroom to push or pull the regular sliders. A too complex workflow will both take up time and can easily make you a little unsure, whether you should have pulled this or that slider. When you can, it is better to keep your workflow simple by using the Lightroom HDR merge feature and get some more time behind the camera instead. You’re right. this is the most simple way to combine bracketing pictures into a wonderful single picture. There are a lot of new programs, but it’s all so difficult with a whole lot of sliders that at the end you can stop it and start again with only LR. Thanks a lot for the tip and I will send it further.